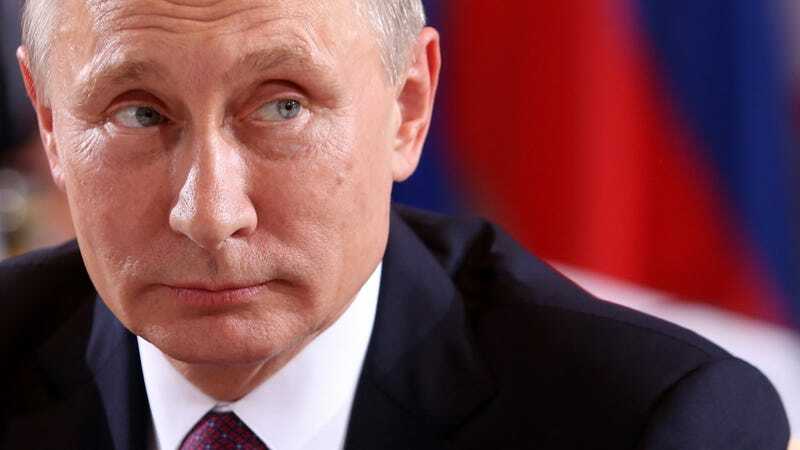 Russian President Vladimir Putin may have pulled off the biggest spy operation of his career: hacking the faith out of Americans’ confidence in their key institutions. In response to those reports and a rare display of bipartisanship, lawmakers have called for a probe into Russia hacking in the U.S. election. President Barack Obama has also ordered the intelligence community to perform a review of possible foreign election tampering dating back to 2008, and plans to share that report with lawmakers before he leaves office in about a month. Until we know, Trump’s team can continue planting doubt in the media and America’s intelligence agencies—which is exactly what Putin wants. Russia has a long history of doing it elsewhere. Malcolm Nance, a former intelligence officer with more than 35 years experience, told Foxtrot Alpha in an interview that the divide between Democrats and Republicans is a perfect weakness for Russian intelligence to exploit. “Russia knows we are incapable of acting in unity as a government short of a military attack,” Nance said. To be clear, Nance said he’s certain that Russia hacked our election and has even written a book about it. CrowdStrike, a cybersecurity firm, found that Russian hackers infiltrated Democratic National Committee networks. The hacking of the DNC only could have been executed by a high-level government intelligence agency, he says. The Department of Homeland Security and Office of the Director of National Intelligence released a joint statement in October accusing Russia of attempting to hack U.S. institutions for the sole purpose of influencing the election outcome. All of these actions are designed to undermine American sovereignty. And the tactics are not new. When Tallinn, the capital of Estonia, removed a Soviet-era statue in 2007, Russian agents were blamed for launching a cyberattack against computer networks of government agencies, media and major banks. One article in the Journal of Strategic Security argued the attack was designed to avenge aggrieved Russians in Estonia over the statue by threatening the nation’s sovereignty. Georgia also knows how it feels to be cyber-attacked by Moscow. Russia hacked into the country’s Internet networks as early as July of 2008, before invading militarily in August. Images of Adolf Hitler juxtaposed against former Georgian President Mikheil Saakashvili covered the website of the Georgian Parliament; Internet service was down for hours in some cases. The motivating factor was to influence public opinion against Saakashvili’s western-leaning government that had long gone afoul of Putin—particularly over the breakaway region of South Ossetia. While it is not clear how, exactly, the hacks influenced Georgians, many were growing weary of Saakashvili by 2008. He left Georgia in 2013 and has since been stripped of his citizenship. The goal there was simply to convince the local population that looking west will not protect them from Russian encroachment. Here in America, Putin wants to create a different kind of destabilization. He wants us to lose faith in American media, an institution with the potential to check government agencies in ways unimaginable in Russia. If Trump can raise doubts that American media are telling the truth, many Americans may begin to question if Putin is really the reason relations between Moscow and Washington are chilly. And if they don’t get any official answers from the CIA that a cyber attack did occur, then they very well may lose confidence in their own intelligence agencies. Rience Priebus, the Republican National Committee Chair and Trump’s soon-to-be Chief of Staff helped in that effort during his appearance on Meet The Press Sunday morning. And so did Kellyanne Conway on Face The Nation. John Bolton, who may soon have a role in Trump’s administration, even suggested that President Obama may have been behind the attack in a “false flag” move. Absurd theories will run wild until our intelligence agencies release an assessment of a Russian cyberattack. Nance believes some of those findings should be declassified to assure the public. Until then, America is at an information standstill and Putin is getting what he wants—confusion and distrust among this country’s population. Terrell Jermaine Starr is a freelance journalist in New York City who specializes in Russian-U.S. affairs and national security. You can follow him on Twitter @Russian_Starr.